One of the most important things a new mother can have is a diaper bag. It is storage bag with numerous pockets and spaces large enough to store baby essentials like diapers, clothes, milk bottles, changing pad, and more. It is used to carry things that the baby needs when going out. 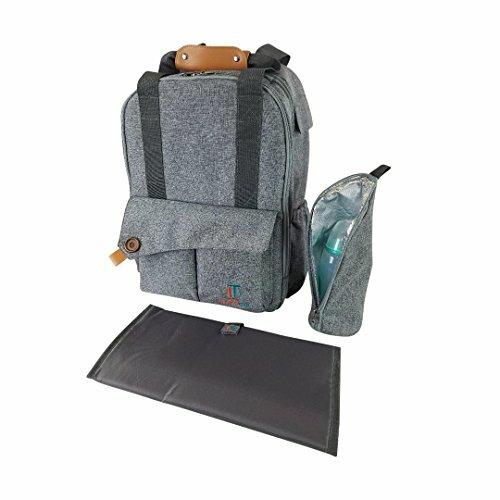 What are the characteristics of a good diaper bag? This article enumerates what to look for in a diaper bag. Diaper bags come in different styles, sizes, and features. In recent years, they have more sophisticated designs. High-end designers like Coach, Kate Spade, and Ralph Lauren started to create fashionable diaper bags which are usually used by celebrity mothers. But more than fashion, what are the other factors to look for in a diaper bag? The structure of the diaper bag defines its sturdiness and comfort. It should have well-reinforced seams and made of waterproof materials for easy cleaning. The stress points or the areas prone to wear and tear should be secured with zigzag stitching or rivets. Zippers should secure the bag; they should be made of metal or sturdy plastic with big teeth. A diaper bag should also be created with comfort. It should have padding on the back and on the back of each strap. The straps should be adjustable to comfortably fit your body. The handles or strap of the diaper bag should be long enough to be hung over the shoulder or short enough to prevent it from touching the ground. Handles can come in different ways – backpack straps, lug handle, grab handle, etc. Choose a model with handles or a strap that will free your hands from the bag so you can do other tasks like holding the baby more securely. A messenger, backpack or shoulder strap is a good handle. Choose a bag with material that is sturdy enough to withstand wear and tear. It should also be water resistant so it can be easily wiped clean inside and out. If you are in a cold climate, avoid vinyl bags because they are prone to cracking in low temperatures. Outer compartments make it more convenient to access items such as wipes, pacifiers, phone, keys, and other important small items. Interior pockets are more durable when made of fabric, vinyl, or mesh to store sanitizers, diapers, and wipes. For infant formula or baby food, an insulated pocket is ideal. Make sure that your milk bottles can fit in the bottle pockets. Compartments are major differentiating factor between a diaper bag and a regular purse or backpack. Diaper bags have more compartments and pockets to systematically store baby essentials. Examine the weight of the bag when empty – if it weighs around 3 pounds, it may become too heavy when filled with baby stuff. Choose a bag that is spacious but lightweight to prevent muscle pain and improve comfort when carrying it. Diaper bags usually come with changing pad where you can change your baby’s diapers. It is foldable, easily fits it in the bag, and wiped clean. It comes in different styles – some have more cushioning than others, while others have changing pads connected to the side of the bag. Diaper bags come in different styles. The usual bright colored design speaks of personality, while neutral colors can complement many outfits. Some diaper bags have sophisticated designs so that they no longer look like diaper bags. 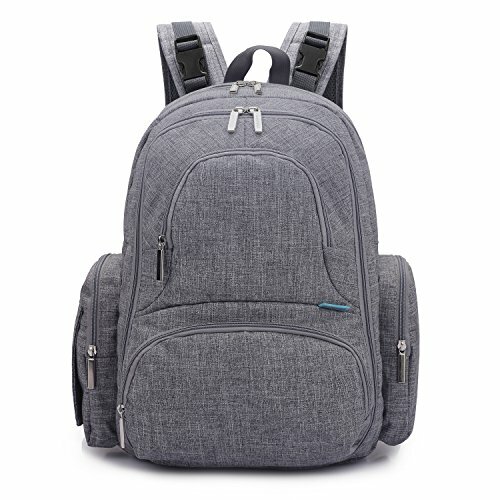 The CoolBell Baby Diaper Backpack is a 26-liter diaper bag with pockets, including side pocket, two insulated pockets, bottle compartment, front pockets, and more. It has changing pad and another insulated sleeve. It is comfortable too because it is built with padding through the shoulder straps and back. The Laguna Tide Travel Diaper Bag is a multi-functional diaper bag made of 300D polyester and a 201D polyester lining. It is waterproof and stays strong. It has a total of 12 pockets including the 3 insulated bottle compartments. It has stroller straps so you can hang it on the stroller for more convenience. It is comfortable and comes in a trendy, unisex style. Make sure that you get a diaper bag with the features above to get the most of your money.